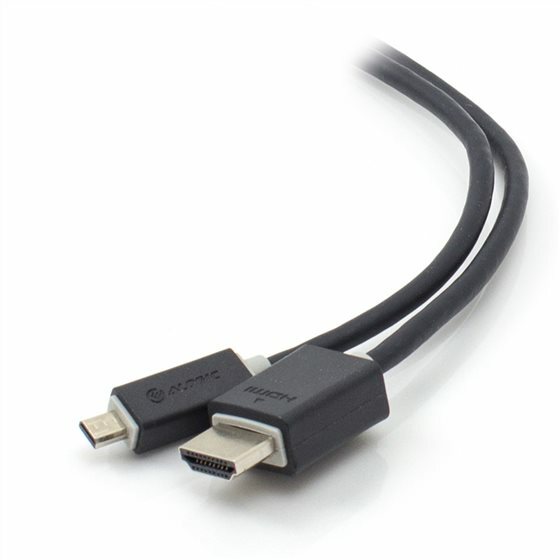 TheALOGIC Pro Series High Speed Micro HDMI to HDMI with Ethernet Cable Male to Male VER 2.0is used to connect Micro HDMI enabled device like mobile phone tablet ora digital camera or camcorder to a HD Display or a projector. This qualitymade cable candeliver a crisp clear audio/video signal for less. This HDMI cables has a premium built quality with Goldplated connectors and is suitable for both home and commercial applications.The fully moulded connector and the PVC jacket provides added flexibility and durability for all types of installation.